Business • Rally planned as negotiators from 12 nations gather at Grand America. Jim McAuley | The Salt Lake Tribune Former Salt Lake City mayor Rocky Anderson greets a friend as other demonstrators gather to protest the Trans-Pacific Partnership talks at the Grand America Hotel in Salt Lake City on Tuesday, November 19, 2013. 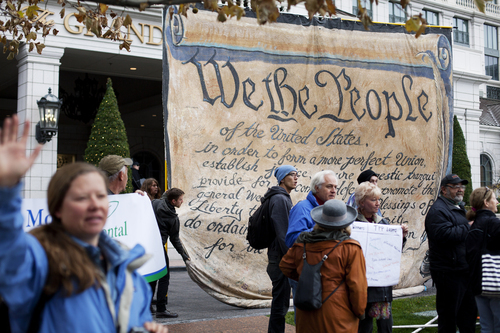 Jim McAuley | The Salt Lake Tribune Eric Ross, of the Backbone Campaign talks with Ian Decker as they hold a banner to protest the Trans-Pacific Partnership talks at the Grand America Hotel in Salt Lake City on Tuesday, November 19, 2013. Jim McAuley | The Salt Lake Tribune Kim Kasey joins a protest against the Trans-Pacific Partnership talks at the Grand America Hotel in Salt Lake City on Tuesday, November 19, 2013. 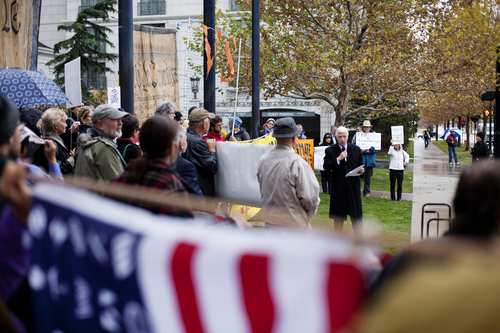 Jim McAuley | The Salt Lake Tribune Former Salt Lake City mayor Rocky Anderson addresses demonstrators gathered to protest the Trans-Pacific Partnership talks at the Grand America Hotel in Salt Lake City on Tuesday, November 19, 2013. 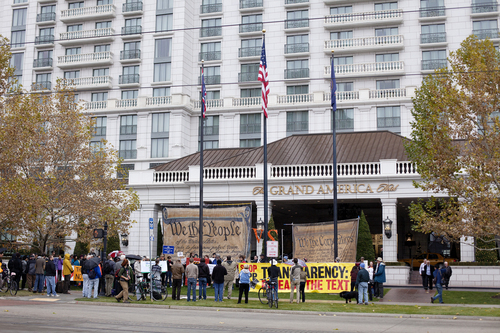 Jim McAuley | The Salt Lake Tribune Demonstrators gather to protest the Trans-Pacific Partnership talks at the Grand America Hotel in Salt Lake City on Tuesday, November 19, 2013. Jim McAuley | The Salt Lake Tribune Chris Davidson, head of security at the Grand America Hotel and supporting police personnel watch as Melanie Martin, left, Denise Davis, Nathan Goodman and other protesters of the Trans-Pacific Partnership and the talks taking place in Salt Lake City on Tuesday, November 19, 2013. 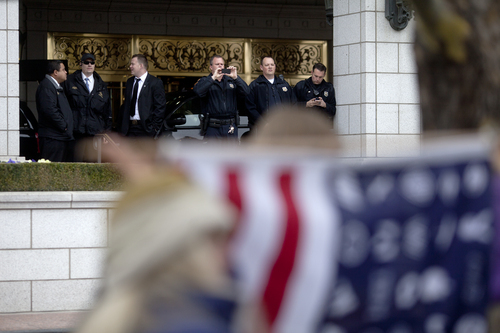 Jim McAuley | The Salt Lake Tribune Security and police personnel take cell phone photoso of the protest forming against the Trans-Pacific Partnership talks at the Grand America Hotel in Salt Lake City on Tuesday, November 19, 2013. 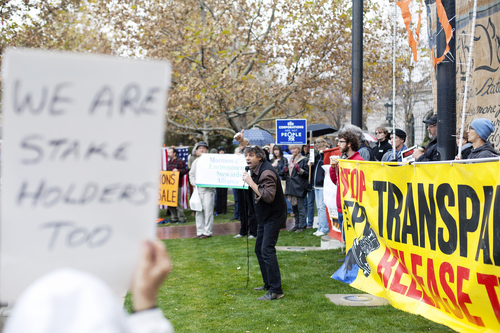 Jim McAuley | The Salt Lake Tribune Arthur Stamoulis, executive diretor of the Citizens Trade Campaign, gathers with demonstrators to protest the Trans-Pacific Partnership talks at the Grand America Hotel in Salt Lake City on Tuesday, November 19, 2013. 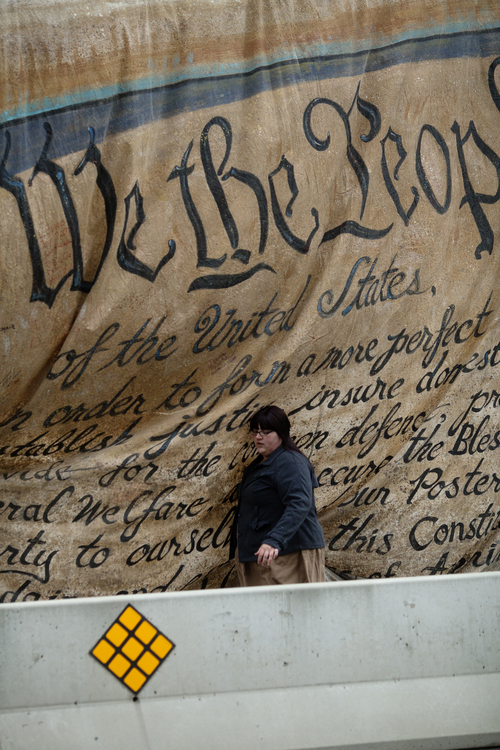 Jim McAuley | The Salt Lake Tribune Chaska Johnson helps to carry a large banner on the way to a protest of the Trans-Pacific Partnership talks at the Grand America Hotel in Salt Lake City on Tuesday, November 19, 2013. Jim McAuley | The Salt Lake Tribune Chaska Johnson helps to carry a large banner on the way to a protest of the Trans-Pacific Partnership talks at the Grand America Hotel in Salt Lake City on Tuesday, November 19, 2013. 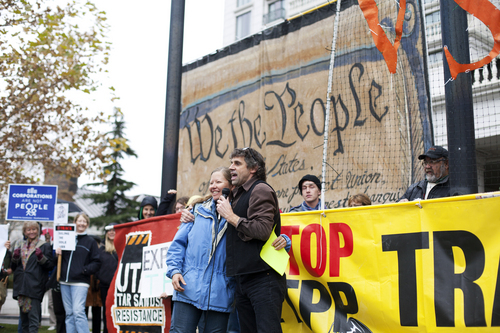 Jim McAuley | The Salt Lake Tribune Bill Moyer, executive director of the Backbone Campaign, and Raphael Cordray of the Utah Tar Sands Resistance speak to demonstrators gathered to protest the Trans-Pacific Partnership talks at the Grand America Hotel in Salt Lake City on Tuesday, November 19, 2013. 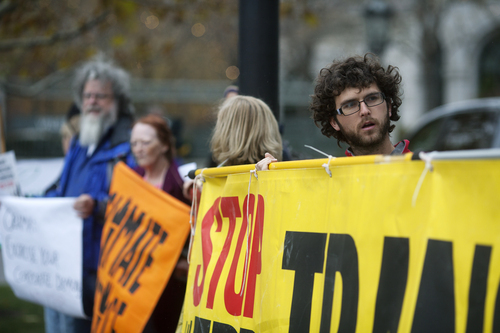 Jim McAuley | The Salt Lake Tribune Raphael Cordray, left, of the Utah Tar Sands Resistance, and other demonstrators gather to protest the Trans-Pacific Partnership talks at the Grand America Hotel in Salt Lake City on Tuesday, November 19, 2013. Jim McAuley | The Salt Lake Tribune Eric Ross of the Backbone Campaign prepares the finishing touches on signs to protest the Trans-Pacific Partnership talks outside of the Grand American Hotel in Salt Lake City on Tuesday, November 19, 2013. Jim McAuley | The Salt Lake Tribune Bill Moyer, executive director of the Backbone Campaign, speaks to demonstrators gathered to protest the Trans-Pacific Partnership talks at the Grand America Hotel in Salt Lake City on Tuesday, November 19, 2013. 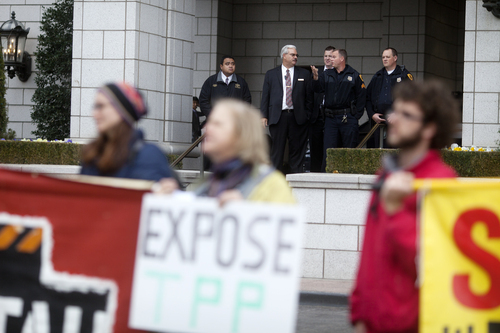 Jim McAuley | The Salt Lake Tribune Nathan Goodman protests the Trans-Pacific Partnership talks outside of the Grand American Hotel in Salt Lake City on Tuesday, November 19, 2013. If negotiators for the United States and 11 other Pacific Rim nations hoped to dodge protests by staging high-level trade talks in seemingly out-of-the-way Salt Lake City, they may have failed. A rally is set for Tuesday outside downtown&apos;s Grand America Hotel, where inside the lead negotiators for the Trans-Pacific Partnership are working toward a new free-trade agreement. The discussions, expected to run Tuesday through Sunday, are being closely watched not only by businesses but also by activist groups concerned by what they characterize as the secret nature of the discussions and possible outcomes. 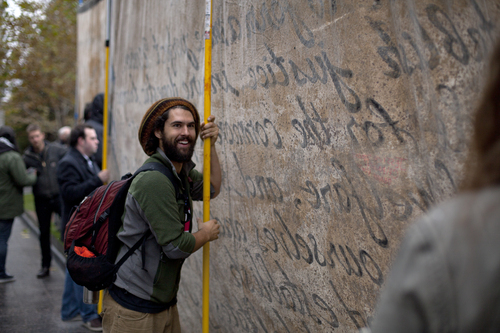 The talks are the 19th round since they began in 2009, with meetings held in locales such as Tokyo; Mexico City; Kuala Lumpur, Malaysia; Ho Chi Minh City, Vietnam; Lima, Peru; and Chicago. Carol Guthrie, a senior adviser for media affairs to the U.S. trade representative, said the criteria for picking sites for the negotiations include availability of rooms, costs and other logistical factors. "The talks are at a very advanced stage," Guthrie wrote in an email. "The goal for chief negotiators this week is to work closely with subject matter experts to advance the ball as far as possible on a number of outstanding issues." 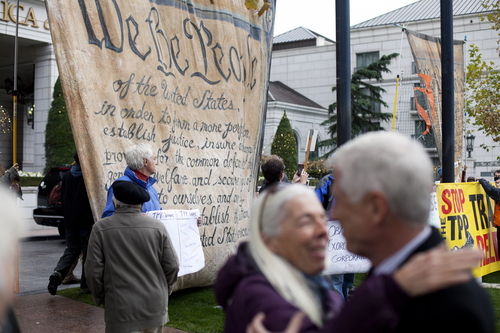 But those advancements behind closed doors are bringing protesters to Utah&apos;s capital. Labor, environmental and consumer activists have scheduled a protest, sponsored by Public Citizen&apos;s Global Trade Watch, the Sierra Club and the Backbone Campaign, for noon Tuesday outside the Grand America. The groups fear the talks will set binding rules on matters such as food safety, Internet freedom, medicine costs, financial regulation and the environment and that the negotiations have "included over 600 official corporate &apos;trade advisers&apos; while hiding the text from members of Congress, governors, state legislators, the press, civil society and the public." Jesse Prentice-Dunn, representative of the Sierra Club&apos;s Responsible Trade Program, said the environmental group worries a final agreement could provide incentives for activities such as national gas "fracking" without adequate environmental safeguards. "To date," he said, "the talks have been happening in extreme secrecy." Last week, WikiLeaks, the group seeking to expose government and corporate secrets, released what it said was the draft of the intellectual-property-rights portion of the agreement, which covers areas such as copyrights and patents. 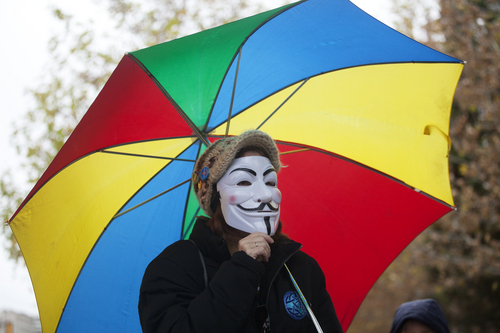 Julian Assange, WikiLeaks editor in chief, warned in a news release that the proposed treaty&apos;s intellectual-property section "would trample over individual rights and free expression, as well as ride roughshod over the intellectual and creative commons." Copyrights and other intellectual-property issues also loom as top concerns of Utah&apos;s high-tech operations. Biotechnology businesses want to see copyrights and patent protection strengthened in some countries so inventions and new products can be marketed without fear they will be copied by others, said Kimball Thomson, CEO of BioUtah, an industry trade group. "There are just so many challenges in the value-creation process in Utah," Thomson said, "that we want to make sure that the things that get built here  that [we] are able to capture the value." 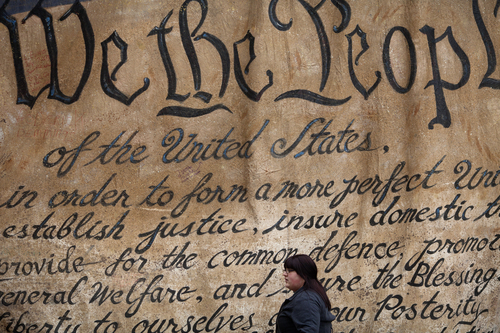 Recent developments may signal rough sledding for congressional approval of any agreement. Groups of House Republicans and Democrats have separately sent letters to President Barack Obama. They oppose giving him "fast-track" authority that would restrict Congress to an up-or-down vote with no opportunities to amend the agreement. 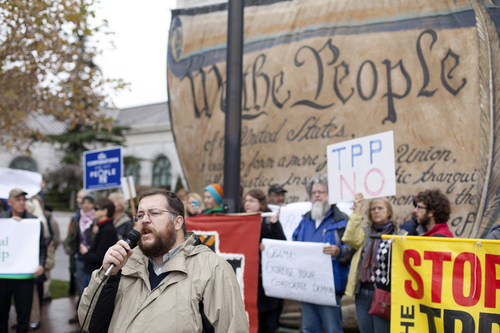 Nations belonging to the Trans-Pacific Partnership are holding trade talks Tuesday through Sunday in Salt Lake City. The nations are United States, Australia, Brunei Darussalam, Canada, Chile, Malaysia, Mexico, New Zealand, Peru, Singapore, Japan and Vietnam.